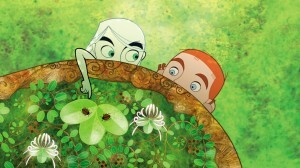 Tonight on a whim the family and I sat down to watch a random movie on Netflix, and we chose The Secret of Kells – an animated Irish historical fiction about Brendan, a young monk living in the abbey of Kells during the age of the Vikings. While looking for a decent screen shot to show you (to the right of this paragraph) I came across mentions of how experimental the artwork was. And a lot of people definitely fell in love with it. I’m writing this post to tell you my take on it – and why I think it’s a wonderfully-done movie. The story itself was very wonderfully done. It had just the right amount of angst balanced against the main character’s heart-felt need to complete this task that came to his abbey in the form of an answered prayer. The opposing forces surrounding Brendan were just as equally balanced: the Norse coming to burn the abbey vs. a little unexpected help from a Norse legend; the fear of one man who would have the people hide behind stone walls vs the fear of another man who would keep running; an illuminating light from the darkness to enhance a monk’s illumination on the pages of a book… there is much more. The layers of story building in this story are amazing. The artwork: I already mentioned that other people called it highly experimental. The truth is, I didn’t find it that experimental. 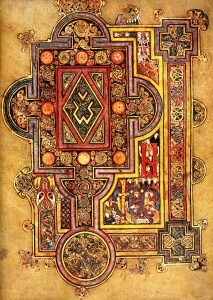 It was plain to see it was highly inspired by the artwork in the actual Book of Kells, but it was nothing I had never seen before. Disney’s Sleeping Beauty was also highly stylized in honor of artwork from the time period it was placed in. The animated feature, The Hobbit, was almost in direct imitation of J.R. Tolkien’s own character designs. But what I thought of the most as I watched was The Thief and the Cobbler, which took about 10 years to make and came out long before this and was definitely a very similar art style, setting and scene tactic, and also a masterpiece. So setting the notion of the artwork being experimental aside, what I can definitely say about this movie is: the settings were lush, the use of color to contrast one event to the next done quite well, the detail pulled me in like nothing had done in a long time, and I couldn’t help but notice transition scenes that were moving illuminations all of their own. When it comes to this movie being a work of art, I can only say it was done by a master illuminator. The dialogue? It didn’t annoy me. I’m picky when it comes to dialogue at times. It was just right. We weren’t spoon-fed information as if we were morons. Nothing was overacted. Motions were allowed to speak for themselves. And what was said made perfect sense. The movie as a whole: omigod. Maybe the action wasn’t all car chases and explosions but it was still a good movie. Go see it.